RESTAURANT WORTHY soup right here. Finally! I sucked it up and actually made a proper dinner. Todd and I also took a couple of loads over to the new rental. It was a late night. Our very, very loud motorcycling neighbor and the fourwheeling kids down the road. The fact that an absolutely horrid, stale smoke smell has impregnated the walls and somehow seeped into all my clothes. Seriously the grossest thing ever. Our landlord, whom I'm pretty sure wants us out so she can demolish the place and build a duplex. Thus, the total lack of keeping up with repairs. The absolutely insane layout of the home. It's basically a tiny, wandering hallway. No bedroom. No dishwasher. No lawn. Serious water problems. Floor literally crumbling. Part of roof ripped off. Washer broken. Etc. Those are the biggest issues. And of course, it has a few redeeming qualities as well. Mainly that it's situated on a fairly lightly trafficked road and it has a bit of privacy. Anyways, thanks for letting me rationalize our move with you! Point is, I haven't really cooked anything substantial in about a week and I was maybe going a tad crazy. There's only so many bagels and bananas one can consume! This soup was the perfect remedy. 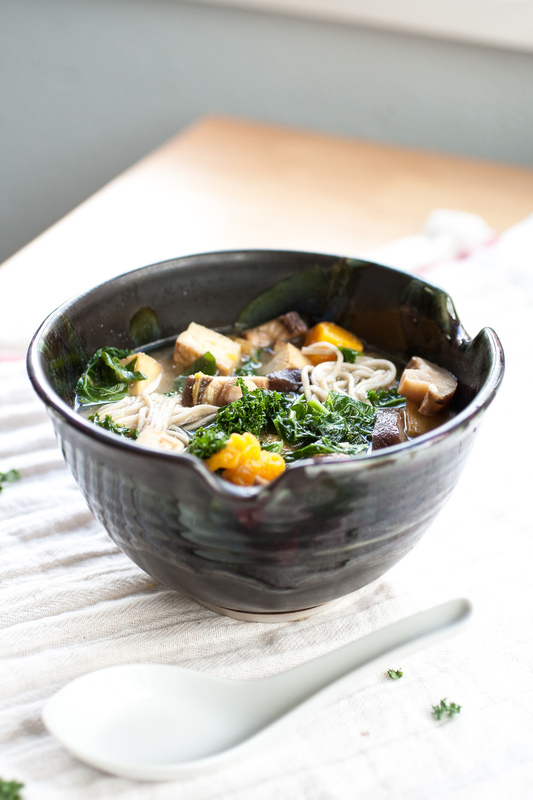 Miso, shiitake, tofu, kale, soba, and butternut squash all married together to help Todd and I keep our immunity robust during this stressful (and dusty!) time of chaos. Whole foods, clean eating, and completely delicious. 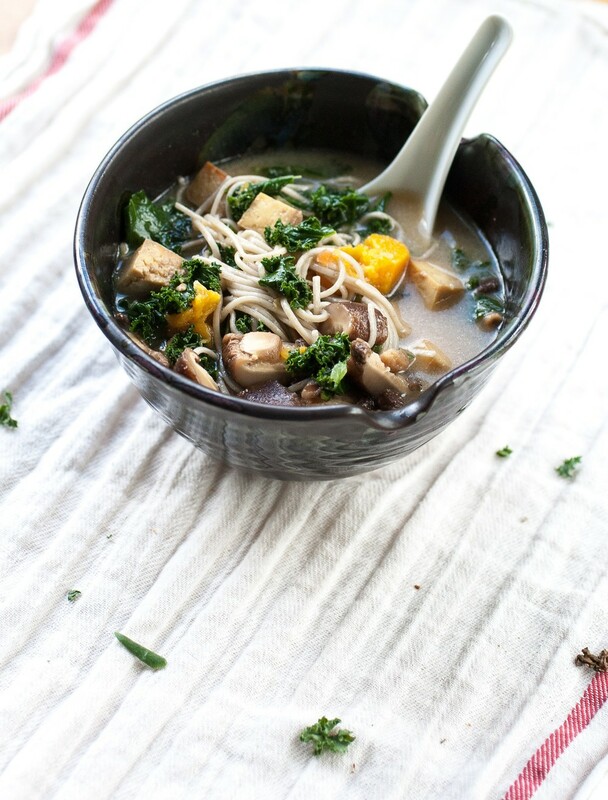 An umami-filled, restaurant-worthy, and hearty soup! Notes: Fresh butternut squash may be used instead of frozen, but the cooking time may need to be adjusted accordingly. Be sure that boiling the noodles is the very last thing prepared. They shouldn't sit, for they will stick together. Preheat oven to 375 F. Press the tofu if necessary and towel dry. Dice and scatter on a rimmed baking sheet along with the diced squash. Drizzle with sesame oil and liquid amino acids. Brush to coat evenly and bake at 375 F for 35 minutes. Add to the soup when done baking. Meanwhile, combine all the broth ingredients (excluding the miso and lime juice) in a large soup pot and bring almost to a boil. Then, kill the heat and stir in the miso and lime juice, ensuring there are no miso clumps. Now, wash and rip or chop the kale into small pieces. 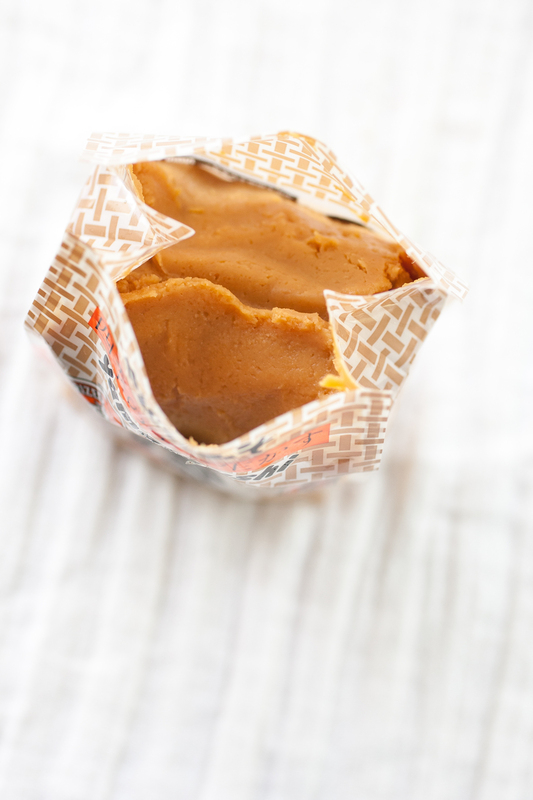 Place in a microwave safe bowl and cover with a microwave safe plate. Zap on high for about 3-4 minutes, until fragrant, bright green, and limp. Set aside. 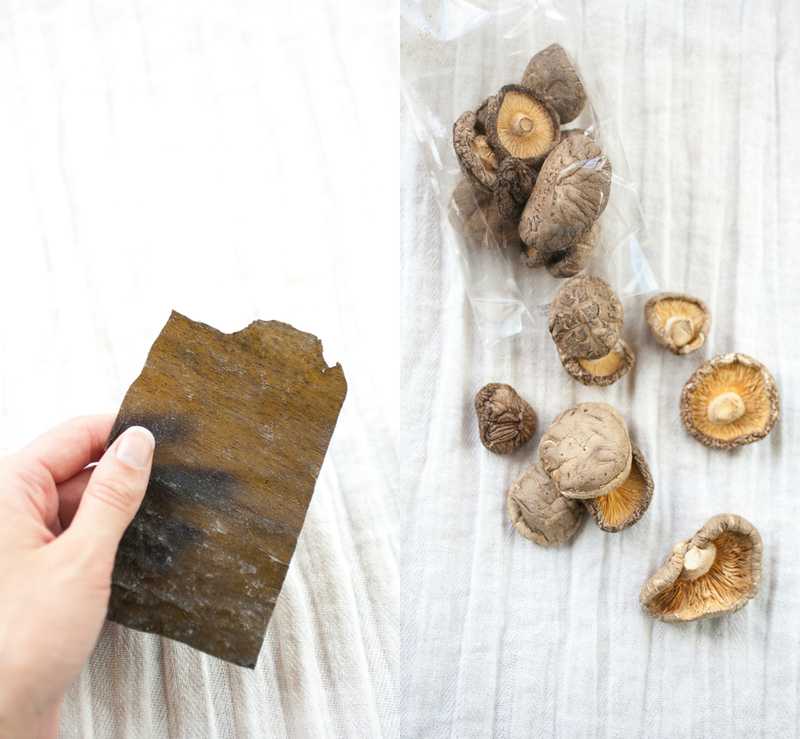 Pull the whole mushrooms and kombu out of the broth with a slotted spoon and carefully slice all into bite size pieces. Add back to the broth along with the cooked kale and stir. Careful not to burn your fingers! 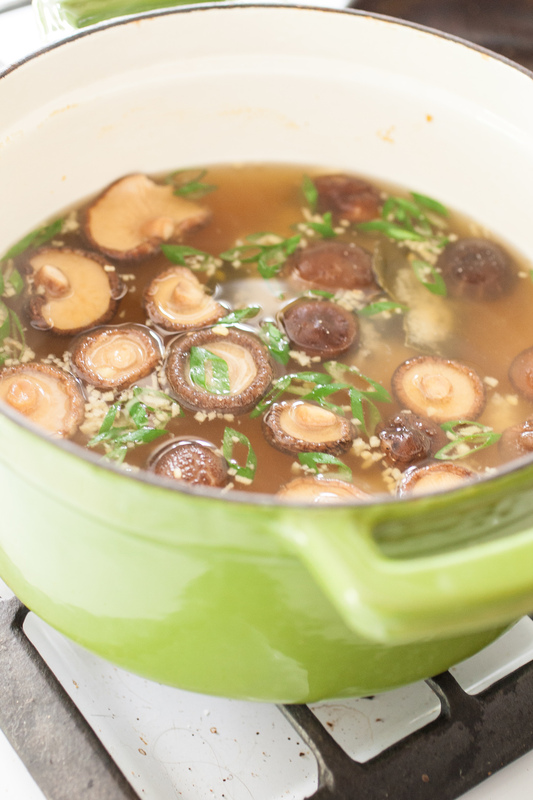 Bring a medium saucepan to a boil for the noodles. Once boiling, add the dried noodles and cook for about 4 minutes until al dente. Drain, return to pot and coat with sesame oil to prevent sticking. 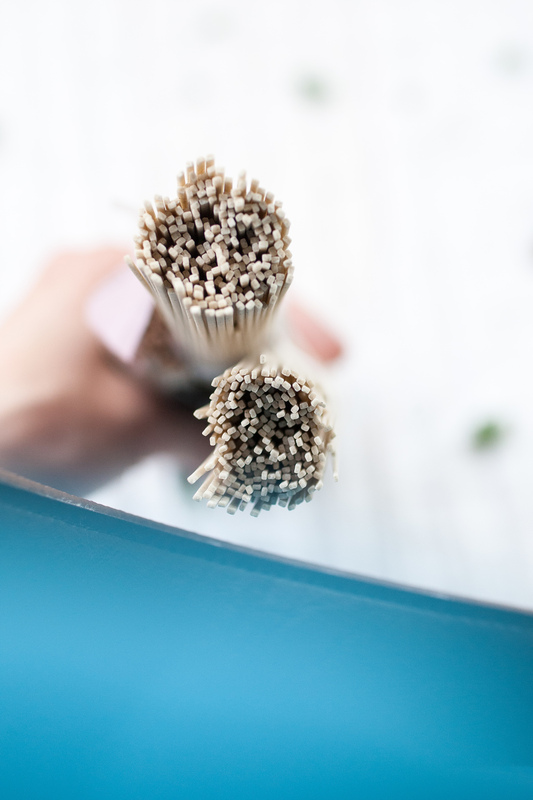 To serve, place desired amount of soba noodles into a bowl and laden the soup over. Serve hot. Good Deed of The Day: This is so sad. One life for another in this case does not seem to be the appropriate action. Sign this petition to save the killing of this family's beloved furry companion, Nika the Husky.